Anna Kandinskaya studied at the Moscow and Bern Conservatories, completing her postgraduate studies at the Royal College of Music in London. She has been awarded the First Prize in the International Violin Competition of the Munich Konzertgesellschaft and was the winner of the International Yehudi Menuhin Competition in Paris. Anna Kandinskaya had the privilege of working regularly with Lord Menuhin and touring all over Europe under his conduct. Anna Kandinskaya performed as a soloist with numerous orchestras, among others the St. Petersburg Philharmonic and the Royal Philharmonic Orchestra. 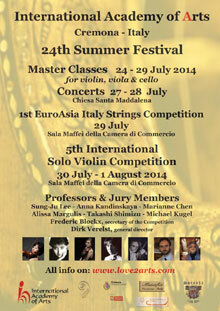 She is also a regularly invited artist at Yuri Bashmet's Music Festival in Elba, Italy. Recently, she appeared as a soloist with the Moscow Chamber Orchestra. Anna Kandinskaya performed chamber music with partners such as András Schiff, Gidon Kremer, Wolfgang Sawallisch, Natalia Gutman, Boris Pergamenschikow, Yuri Bashmet, Lars Vogt, Mikhail Rudy, Miklos Perenji, Nabuko Imai and the Viennese Altenberg Trio. Since many years, Anna Kandinskaya is holding a teaching position for violin at the University of Music and Dramatic Arts in Vienna having already trained various finalists of major international competitions and players on prominent positions in some of Europe's leading orchestras. Anna Kandinskaya is a tutor for violin on masterclasses all over the world and is primaria of the Vienna-based Razumovsky Stringquartet. A violinist of dazzling technique and rare sensibility, Sung-Ju Lee has captivated audiences around the world with her "imaginative playing and luminous sound", her "impeccable technique", and her "taste for the dramatic and unflagging sense of authority". This acclaimed violinist launched her career with a New York debut in 1977 as a winner of "Young Concerts Artists" and was immediately recognized as "a first-rate violinist" by the New York Times. Designated by Musical America Magazine as one of the country's most outstanding young artists, she has a long list of prizes, starting as a top prize winner of Ewha Young People's Competition in Korea at age 11. She has gone on to win 1st prize in the Wieniawski-Kosciuszko Violin Competition in New York, a top prize in the Sibelius competition in Finland, a special citation as a finalist in the Tchaikovsky Competition in Moscow and a Laureate diploma from Queen Elisabeth Competition in Belgium. "When Sung-Ju Lee plays, the impact is immediate", noted the Los Angeles Times. "She is exciting and powerful." "Miss Lee has a tone of pure gold", said the Oklahoma City Journal Record. Upon graduation from the Julliard School (where she studied with Ivan Galamian, Margaret Pardee, and Dorothy Delay), she was awarded the First Kreisler Fellowship for graduate studies. Her list of accomplishments is impressive, beginning with her appearance as a soloist with the Seoul Philharmonic at the age of 9. 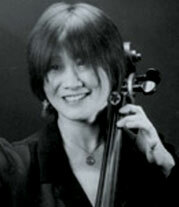 Marianne Chen, born in Chicago, studied cello at the Juilliard Pre-College, and then at the Juilliard School under Lorne Munroe where she obtained her bachelor's degree. She continued her studies under Antonio Janigro at the Musikhochschule in Stuttgart and the Mozarteum in Salzburg. For several years, she studied Chamber music with Robert Mann (Juilliard Quartet), with Alexander and Mischa Schneider (Budapest Quartet), and Felix Galimir. She also studied at the Chigiana Academy of Siena, where she obtained the Diploma of Merit. Marianne Chen was guest professor of cello at Garden State Music Festival (New Jersey), the Gustav Mahler Academy in Bolzano, the School of Music in Fiesole, the Juilliard School and in Greece. She has also been invited to assist Natalia Gutman. 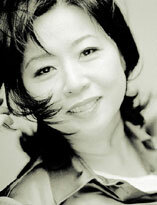 Marianne Chen has performed in major concert halls and has recorded for Dynamic, Tactus and the New Age, and various television networks. Marianne regularly holds master classes in Europe and the United States. Many of her students have won prizes in national and international competitions. Takashi Shimizu was born in Yokosuka and started playing the violin at the age of six. 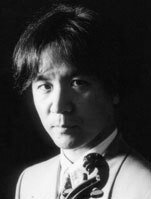 Three years later, he won the important "Japan Music Competition" and made his television debut with the NHK Symphony Orchestra. He first became the focus of public attention in his country at the age of 17 when, after winning three more prizes in national competitions, he won a scholarship to study under Jascha Heifetz at the University of Southern California. He also studied with Michèle Auclair and Yfrah Neaman. Takashi Shimizu has been awarded many prizes at international violin competitions. His chamber music partners include Martha Argerich, Yehudi Menuhin, Ivri Gitlis, Fou Ts'ong, Alexander Rudin, Mischa Maisky and Pavel Gililov. He has made a number of recordings with the London Symphony Orchestra, next to Bach's Solo Sonatas and Partitas, Ysaÿe's Solo Sonata and Prokofiev's Sonatas. Takashi Shimizu is currently professor at the Tokyo National University of Fine Arts and Music. Dirk Verelst, violinist and conductor, studied at the Royal Flemish Conservatory of Antwerp with Franz Wigy and in Geneva with Henryk Szeryng. Afterwards he specialized in the performance of 18th century music with Sigiswald Kuijken and became a member of the Baroque Ensemble "La Petite Bande", with whom he played concerts all over the world and was able to perform on radio and television and to record for well-known record labels. Dirk Verelst was a violin and chamber music professor at the Conservatories of Antwerp and Maastricht. Since 1991, he is the president of the International Academy of Arts, and, since 2003, the artistic director and president of Love²Arts. In collaboration with the Lakatos Ensemble, he has conducted concerts, live television performances and DVD recordings. Dirk Verelst was guest professor and conductor at the Xing-Hai Conservatory of Guangzhou (China), guest professor at The Korean International University of Arts in Seoul, guest conductor of the Collegium Musicum of Kyiv, a jury member at different competitions such as the International Shabyt Violin competition in Astana (Kazakhstan), and guest professor and conductor at different master classes with his friends and colleagues, such as Mikhaïl Bezverkhny, Herman Krebbers, Philippe Hirschhorn, Roby Lakatos, Igor Frolov, Igor Oistrakh and Sung-Ju Lee.